During energetic postwar years, townspeople scrambled to build enough two or three bedroom frame rambler homes and schools for all grades, and to pave enough streets for all the people moving here. Two major freeways, I-35W and I-494, were constructed. People became curious about a new entertainment medium, television. An active Chamber of Commerce, established in 1954, symbolized increasing industrial and commercial growth. 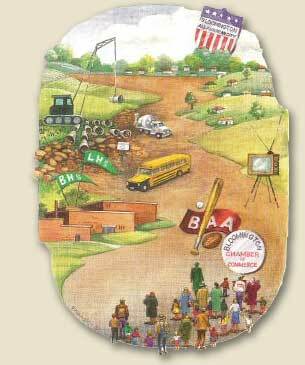 In 1955 the Bloomington Athletic Association (BAA) began to organize youth in sports. Bloomington High School was relocated and would soon be renamed Lincoln High School. Bloomington elected to become a city on November 8, 1960, as the population exploded that year to over 50,000. Concerned citizens rallied behind construction for public water and sewer lines and in 1961 Bloomington proudly accepted the "All-America City" award. Watercolor renditions © 1996 by Elizabeth Hood Anderson, Artist. History Note Cards are a project of Bloomington Community Foundation and the Bloomington History Clock Tower Association.